Huck le Berry is a nickname my brother gave me many years ago. I had spent a couple of weeks in France, my first visit to the land of wine, cheese and romance. Talking to the French I realized that it is almost impossible for them to pronounce my name correctly. Heike, an easy enough name I suppose but not when you are French. To begin with, the French do not pronounce the ‘h’ at the beginning of a word. Eike. That would not have been all that bad but: they also skip the ‘e’ at the end. Eik. I cannot say I was happy about that. Eik. ( Pronounced “ike”). But for some reason that was still not enough, they continued to mutilate my already short name. Eik turned into Ack or Uck or something like that, it was not a name any more, or a word, or anything really. Letters had been swallowed and sounds rendered unrecognizable. There was not much left of my name and what was left sounded like someone trying really hard to fight nausea. Nothing romantic about that. Ehud asked me the other day if Heike was always your name. He thinks you may have changed it when you came here. I’d never thought of that possibility, though I know it happens. When I arrived, many people wanted to call me Chava, but I insisted on keeping Eva. From what you’ve written here, it sounds as if you were always Heike. But Ehud got me wondering: were you always Heike, or were you called something else as a girl? No, I was always Heike. Well maybe not really. It is the name I was given but when I was small no one ever called me Heike. I was either Kucki of Backe (referring to my chubby cheeks 😉 ). I am glad you kept your name Eva and did not become Chava. Pingback: The “little crochet guy” who became a pastry chef | What Inspires Your Art? 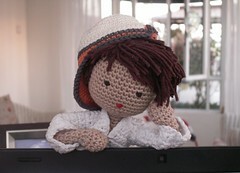 Love your post, website and the cute little crocheted doll!